Halloween is right around the corner. Instead of simply clothing yourself or your kids in familiar costumes, think outside the box. How can you integrate your wheelchair or adaptive equipment in a way that’ll impress the other trick-or-treaters or coworkers? Here are a few trends we’ve seen with Halloween costumes that can give you a little inspiration. These Halloween costume ideas are simple, inexpensive, and quick to DIY — the perfect combo for anyone who needs to make a costume for personal use or for their kids too. Turning your wheelchair into a vehicle opens the door for so many costume ideas. The main concept is to turn your wheelchair into a vehicle of some sort, with the added bonus of having a costume only people in wheelchairs can do. These costume ideas are great for kids and adults alike. And you don’t have to limit yourself to Batmobiles and Mario Karts — you can make a makeshift dragon or a cardboard horse too. If you have balloons and an aspiring aviator, you can even be the floating house from Up or a hot air balloon pilot. Try taking it retro too. Take a look at the past — costumes like retro flight attendants or pilots and their airplanes, Doctor Who and their TARDIS, Mary Poppins with her umbrella, or Mr. Rogers in his neighborhood trolley are all bound to be hits too. You can whip up any of these costume ideas with just some cardboard boxes, foam board cutouts, and some creativity. Before you start anything, measure your power chair, wheelchair, or scooter. If you’re making this costume for one of your younger kids, do the same for their adaptive stroller with the added precaution of ensuring there’s plenty of space for them to maneuver the wheels. There are even some costumes that require a wheelchair to really do the best way. 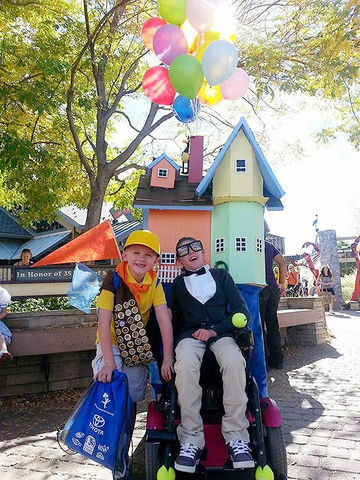 Dressing up as famous people or pop culture figures who use wheelchairs is sure to be a hit at parties (and the workplace too). Plus, a lot of these costumes are easy to get a head start on by looking at your own closet and adaptive equipment options. All it takes are a few props to push you to the next level. Need inspiration? Pull from the popular TV and movie characters that people have been talking about all year. You can go for timeless characters like Stephen Hawkings, Frida Kahlo and Professor X to be recognized immediately. If you want an outfit that may take a second to place, you can also try on costumes like Oracle (Barbara Gordon) from Batman or Artie Abrams from Glee. It isn’t Halloween without the spooky classics you see on TV. Easy to recognize and even easier to find ready-to-wear costumes for, you can always save time by finding a witch or vampire costume. If you want to go this route, you have a few options to help you plan for the 31st. These iconic costumes should be good to go for just about anyone, but what’s the fun in that? We recommend add a fun twist by converting a wheelchairs. And for even more awesome Halloween costume ideas, explore our Halloween costume contest from last year. If you need inspiration or need to see a few more costumes in action, check out our Halloween costume board on Pinterest.